Korg Forums :: View topic - do we have a classic post on synth mags? do we have a classic post on synth mags? Posted: Sun Oct 01, 2017 2:58 am Post subject: do we have a classic post on synth mags? and for that matter all music industry magazines? some of those are free for like studio owners etc. Current Gear: Korg TR Rack, korg m3 expanded radias firewire 88 key Radias r on mat, korg radias r on mat on 61 key bed, Korg triton rack w 96mb ram scsi port, 4) korg RADIAS-R on big rack, korg kaossilator pro plus, 4) roland integra7, roland xv5050, 4 Roland sc55, 2 roland sb55, Roland MSQ-100, 2 emu proteus 2000, 2 Yamaha TX81Z , Yamaha fs1r , 5) fostex 2016, behringer fx2000, 2) roland a800 pro, 2) roland a88 and 2) a49 3) m audio m88 and 1) m49, roland juno, Doepfer Dark Time, Doepfer MAQ 16/3, Manikin Electronic Schrittmacher, most soft synths. cake walk all old and new versions. 4 schecter guitars, 2 elevenracks, most mxr effects, 2 zoom r24, avid pro tools 11. MRT midi Breath Controller. 4 studio rooms. So basically you're trying to get free stuff that other people have to pay for. Nice. I've got tons of ancient S.O.S. & FM and may need to get rid at some point. I tossed a 5yr collection of SOS's back in 2009. Sorta wished I didn't for awhile, but SOS have all the articles in their back issues on the Internet Archive now, so nothing lost really. I really wish I still had my Audio Technology collection. There were a couple of producers that would do monthly articles on studio technique and the like which were incredibly informative. They too have some of their old articles archived, though they are not as easy to find as the SOS articles. How about this archive site? Derek you reminded me of the Roland blogs. They do tend to revolve around Roland products but do have a good amount of info on may aspects of music creation and production. And each region has it's own blog, just search for "Roland Blog" with your favourite search engine. I'm just about to thow out a 7 inch tall stack of Keyboard magazines and a 2 foot tall stack tall stack of Guitar Player mags. I'm going to be moving and since I haven't really ever looked at them since I first read them, away they go. If music is the food of love, play on and play loud! Gear: Kronos 73, Triton Pro-X, Wavestation EX, Polysix, King Korg, Monotron and Monotron Duo, Minikorg, 1 Roland U-20, Hammond M3, 4 accoustic and 6 electric guitars, 1 Ibanez 5 string bass, a bunch of microphones and other very cool toys, 1 wife and 2 cats! Some mags are great reference material and some are just advertising material for the most part. I don't know why it took me so long to notice, but I just noticeed last night Ask.Audio is actually a training company, not a music and production site. Suppose that explains the always great reviews they give everything that comes their way. A week ago I decided to once an for all wrap my head around osc sync and why detuning the two osc's didn't actually create a detuned sound. So I typed "hard sync" into my favourite search engine expecting to get a load of result with nothing to do with audio synthesis and was amazed at the info that came up. First there is the one page that cleared up oscillator sync straight away: http://www.cs.cmu.edu/~eli/papers/icmc01-hardsync.pdf<-pdf which will behave like a download most likely. Here's another article about hard sync, but a little less techy: http://www.harmonycentral.com/articles/all-about-synthesizer-hard-sync Harmony Central is a great site that's been around forever it would seem. 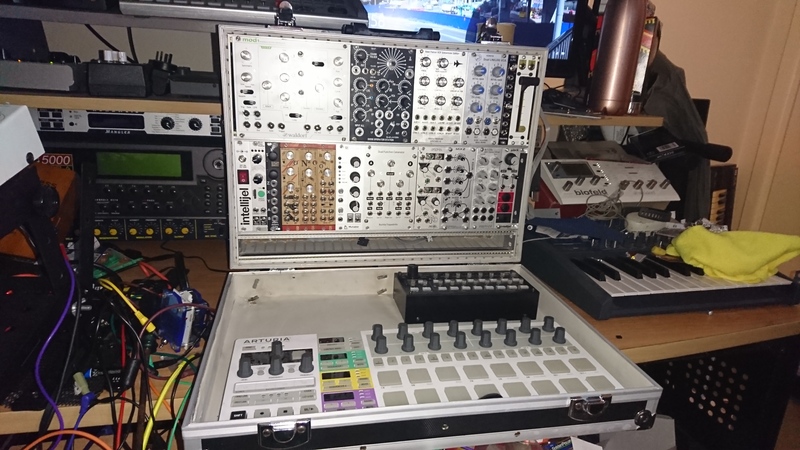 Then there's this site: https://learningmodular.com/ The name would infer it's a modular resources site, which it is, but there is a lot that can be learnt about non-modular synths from the site. Check out the articles before the training. I've found that even though I've been playing with synthesis for three decades, I can still learn new things by revisiting old topics.